Tehri is a mildly spiced one Pot ,Turmeric Rice with vegetables.Healthy Foxtail Millet Tehri is a version that uses Millets instead of Rice. The taste and texture is spot on and you will not feel like you have “healthified” a classic recipe.In fact this will become a classic home recipe once you make it. Replacing Rice with Millets makes this a wholesome meal- full of fibre and omega 6’s without the extra carb burden.If you want to read more about Millets – read my post on How to Introduce Millets in our diets.This post will give you a detailed comparison of different millets with respect of Rice and Wheat. Growing up we ate so much of Tehri that it’s almost a part our food fabric.That’s why I was initially skeptical about making a Foxtail Millet Tehri.Though, after making it the first time, we loved it so much that its become a permanent part of our weekly menu! And it’s here to stay!! A typical Tehri is made in the pressure cooker with seasonal vegetables like Cauliflower, peas and carrots but it can be easily made on stove top or in the instant pot too.I have given both those recipes. Read more about millets benefits and how they compare with wheat and rice on my how to introduce Millets in our diets. 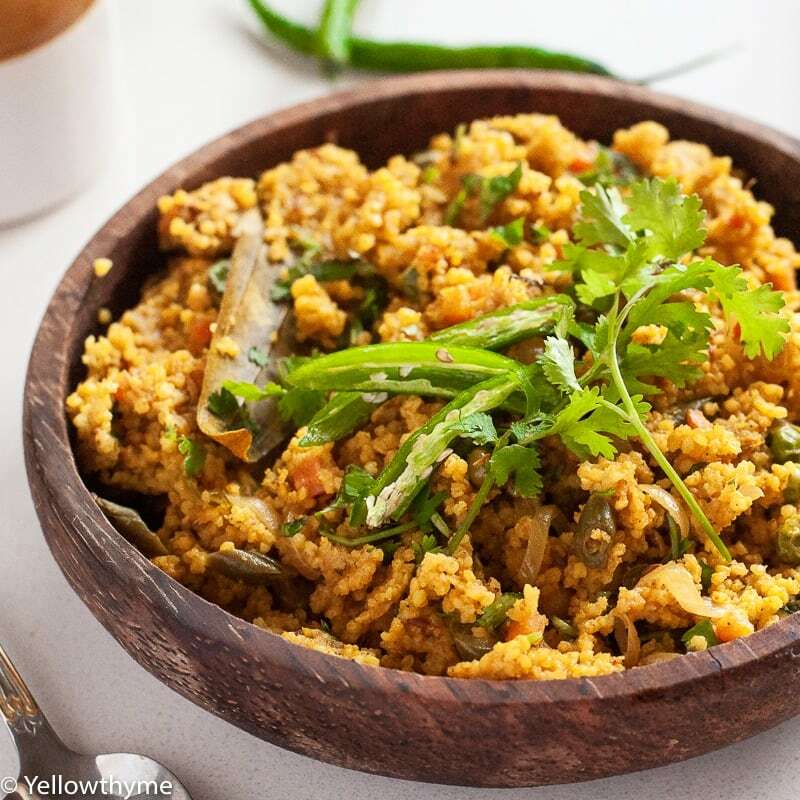 Healthy Foxtail Millet Tehri - Easy to make ,Vegetarian, One Pot Indian Turmeric Millet Pulav Recipe with Instant Pot and Stove Top recipes. Heat the Ghee/Oil in a pot. Add Cumin,Bay leaf and Green Chillies.Once it starts spluttering, add garlic and ginger.Cook for 10-20 seconds. Add the Sliced onions, carrots,beans and cook for 2-3 minutes.Sprinkle the Garam Masala, Turmeric and add the Yogurt. Stir the Pot,Add Millets.Add 2 cups of water.Season with salt. Cover and cook for 15 minutes on low-medium flame. Garnish with coriander leaves and serve with yogurt. Set the instant pot to "SAUTE" mode.Once Hot,Add Ghee/Oil. Add Cumin,Bay leaf and Green Chillies.Once it starts spluttering, add garlic and ginger.Cook for 20-30 seconds. Add the Sliced onions, carrots, beans and cook for 5 minutes.Sprinkle the Garam Masala, Turmeric and add the Yogurt. Cancel the Sauté Function.Pressure Cook for 8 minutes with the valve at sealing position. Let the pressure escape on its own.Open the Instant Pot once the valve drops. If you Love the Recipe, Please leave us a comment ! I would love to hear from you! If you are new to the Millet world, you should read my post on How to Introduce Millets in our diets to understand whats and hows of Millet. Here are some other Healthy Millet Recipes that you will love!